Thoracic surgery encompasses procedures on organs or other structures of the chest. The major areas of thoracic surgery include pulmonary (lung) and esophageal surgeries, as well as cardiac (heart) surgery. Conditions often requiring thoracic surgery run the spectrum from potentially life-threatening illnesses such as coronary artery disease and lung cancer to more minor conditions such as gastro-esophageal reflux disease (GERD). While surgery is intended treat or prevent these and other ailments, it does present the possibility of serious injury or death if the surgeons and other involved practitioners fail to meet the standard of care. What does that mean? It means doctors have to do what prudent doctors should do and they have to pay for their mistakes if they are hurt someone because they were not providing quality care to a patient. Paradoxically, many malpractice claims in thoracic surgery arise before surgery occurs—if it happens at all. In many instances, the victim’s injury or death was due to the failure of the surgeon to perform surgery in a timely manner, or the failure to even advise surgery as the appropriate treatment. Such errors can result in the unnecessary advancement of disease, such as the growth or spread of lung cancer, or a sudden acute event such as a heart attack that may have been avoided by timely surgery. In any case, once surgery is determined to be the best course of action, it is the responsibility of the surgeon and his or her team to perform the procedure correctly and manage the patient’s post-operative care appropriately. One of the most common errors in thoracic surgery is to accidentally nick, perforate, or otherwise injure neighboring organs, vessels, nerves or tissue during surgery; these mistakes may result in any number of serious complications depending on the location of the injury such as uncontrolled internal bleeding, infection in the chest cavity, collapsed lung or death. Perhaps unsurprisingly, a surgeon’s judgment error, carelessness and/or memory failure is often the cause of these injuries. Furthermore, such errors may be avoided by meticulously reviewing the patient’s history to identify potential challenges that may be encountered during surgery; certain characteristics, such as a patient’s age or pre-existing medical condition, can inform a surgeon as to certain precautions that should be taken before, during and after surgery to reduce the risk of complications, as well as to determine whether surgery is the appropriate course of treatment at all. 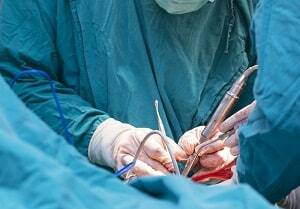 While shocking, and despite clear guidelines intended to avoid such mistakes, another common malpractice claim in thoracic surgery is that of a foreign object being left in the patient’s body following surgery, such as a sponge or surgical instrument. The result is typically intense pain and/or infection requiring a second surgery to retrieve the object, treat or prevent infection and repair any damage. Many studies have been done to identify ways to reduce the incidence of this kind of mistake; however, even those precautions as simple as counting the surgical tools before and after surgery are often ignored. Malpractice claims following thoracic surgery frequently stem from the failure to manage postoperative care adequately, which encompasses everything from monitoring for signs of infection or postoperative pulmonary complications (such as pneumonia or collapsed lung) to medication errors. Notably, surgeons can take steps to reduce the risk of major postoperative complications by, again, carefully reviewing the patient’s history to identify potential risk factors (including advanced age or pulmonary disease), counseling the patient to take certain steps to reduce his or her chance of a complication (such as quitting smoking ahead of lung surgery), and anticipating problems so that postoperative care will be adequate and proper (for example, taking care to avoid overmedication resulting in too-shallow breathing and oxygen deficiency, or enlisting the assistance of a respiratory therapist). The most common esophageal surgeries are those used to treat GERD. One procedure involves completely removing the damaged portion of the esophagus (esophagectomy). Malpractice claims following this procedure stem from the aforementioned injuries to other organs during surgery, as well as leakage of the contents of the esophagus into the chest cavity resulting in damage to other structures and infection. Another routine surgical procedure on the esophagus, also used to treat GERD, is one in which part of the stomach is wrapped around the lower portion of the esophagus (fundoplication). Frequent mistakes particular to this procedure include excessive wrapping of the esophagus (resulting in gagging, bloating and difficulty swallowing), slippage of the wrap, perforated stomach or esophagus and nerve damage. Common heart surgeries range from the relatively minor placement of a pacemaker to the more major coronary artery bypass grafting and/or valve repair or replacement. In addition to injuries sustained during surgery (damage to the heart itself, major vessels or nerves), a rising number of malpractice cases stem from unnecessary surgery—in particular, advising the patient and his or her family that surgery is the best option when, in fact, the right medication may actually have the same benefit as surgery with less risk of complications. Mismanagement of medication following surgery is another common claim, often involving the use of too much or too little anticoagulants (blood thinners) resulting in clots or internal bleeding. Many types of thoracic surgery can now be accomplished with less invasive laparoscopic, video-assisted techniques, and robotic surgery (although the latter is not without problems). Although the pain and recovery time may be less extensive while accomplishing the same goals of traditional (open) surgery, such techniques are not without complications. Malpractice claims resulting from these types of surgeries include leaks, bleeding, wound infection, fluid buildup and subsequent infection in the chest cavity, pulmonary edema and deep vein thrombosis—all of which may result in prolonged hospital stays, pain and suffering, the need for additional surgeries and even death. When appropriate, thoracic surgery can be lifesaving. But when the surgical team falls short of the standard of care, the consequences can be devastating. In so many malpractice cases, the injury or death could have been avoided had the surgeon simply followed well-established guidelines for assessing and minimizing the risk inherent in these types of procedures, or reacting appropriately when complications arose. Whether in the interest of time or money, or because of a surgeon’s poor judgment or lack of skill, the patient’s health is needlessly compromised with painful and long-lasting effects. Our malpractice lawyers handle surgical malpractice cases involving death or serious injury. If you or a loved one have sustained a serious injury as a result of a negligent doctor or health care provider, call our malpractice attorneys at 800-553-8082 or get a free online consultation.